We feel almost honoured to have stumbled upon this fantastic XJ-S. 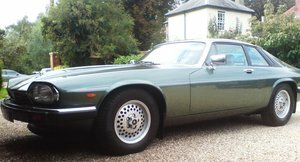 The car was originally supplied by Jaguar in Cardiff as a company car but when it was 2 years old it was then sold to a private owner. 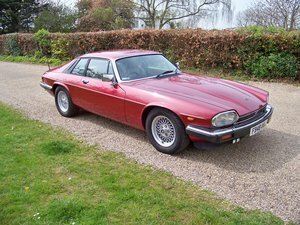 This private owner then kept the car for nearly 33 years before finally letting it go to a known classic Jaguar collector 2 years ago. We have the car directly from his collection. He bought two XJ-Ss in the same week (the other a last-of-the-line 4.0 Celebration model) but barely ever drove them and recently decided to sell them. The car is extremely original and every inch of it confirms that it is a car that has been garaged all of its life and never restored. The paintwork is in excellent condition, there is no corrosion anywhere on the car and the interior is beautiful. When it arrived with us we noticed that the front suspension felt a little worn so we fitted new shock absorbers, anti-roll bar bushes and drop down linkage arm bushes. We also noticed that the accelerator was a little stiff so we had the throttle cable renewed. These repairs transformed the car and we now cannot fault how it drives. Everything works with the exception of the radio (although an updated unit would not go amiss) and it is just a pure joy to experience. There is a large folder with receipts and stamps in the service book to show that the car has always been maintained as it should. Please ask any questions you wish, nothing is too much trouble. We welcome absolutely any inspection, test drive or trial.